Children learn from role models. They naturally watch what others are doing as they learn to find their way in the world. A role model may help shape that child’s beliefs, values, and actions. The relationship a child has with his role model is one that often shapes the course of his life. A lack of positive role models can be detrimental to a child’s health, happiness, and success. In the 2011 Youth Risk Behavior Surveillance report, published by a division of the Center for Disease Control and Prevention, some frightening statistics come to light. The report states that in the month prior to the survey, 32.8% of high school students had texted or e-mailed while driving, 38.7% consumed alcohol, and 23.1% used marijuana. Within the 12 months before the survey, 32.8% of students had been in a physical fight, 20.1% had experienced bullying at school, and 7.8% had attempted suicide. The report goes on to address many more behaviors and habits that put our nation’s children in harm’s way. In an age where our youth are at risk daily, children need positive role models now more than ever. 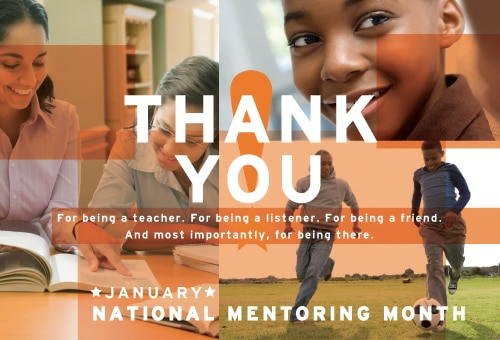 Each January, National Mentoring Month is celebrated in communities around the United States. This celebration was created by the Harvard School of Public Health and MENTOR: The National Mentoring Partnership. In its twelve years, this month-long event aims to bring attention to the great impact mentors have on young children and on communities, as well as to call more people to action. Many political figures have supported the campaign, including former President Bill Clinton, Senator John McCain, and General Colin L. Powell. Some celebrities have also lent their voice to the cause, such as Maya Angelou, Usher, Clint Eastwood, Cal Ripken Jr., and Quincy Jones. Since its inception, each United States President has declared his support of the program. There are many opportunities for you to become a mentor. There are well-known mentoring organizations, like Big Brothers Big Sisters, that have chapters across the country. You can also find smaller mentoring groups in your area that are run through local religious organizations, schools, or community groups. By affiliating yourself with a mentoring organization, you will receive training on your role and responsibilities. An established mentoring organization has strong ties to the community and will support you even after they’ve matched you with a child. Under your guidance, a child has the potential to gain confidence, trust, and self-expression which will likely show itself in all areas of her life. One study, presented at the 2008 Michigan Dropout Prevention Summit, shows that children are five times more likely to graduate from high school if they have a meaningful relationship with an adult. Another study, published by Public/Private Ventures, an independent national research organization, shows that children who have had a relationship with a mentor for 18 months or more are 46% less likely to use illegal drugs and 53% less likely to skip school. A study published in the Pediatrics journal in 2008 highlights the long-term effects a mentor can have on a child. The article, entitled Youth in Foster Care With Adult Mentors During Adolescence Have Improved Adult Outcomes, looks at the subjects’ education and/or employment, psychological well-being, physical health, and participation in unhealthy behaviors. The study found that children in foster care who had a healthy and supportive relationship with a mentor had a more positive transition to independent adulthood. You can have a great impact on a child in your community.